Are Co-Trustees a Good Idea? Your estate plan must be implemented on an ongoing basis. This means that you must not only work with your attorney to choose the right trust language, you must also choose the right trustee to put that language into effect. Trustee selection is a critically important — sometimes the most important — part of the estate planning process. There is no trust that is so well-written that it can ensure against trustee mismanagement. This chapter will discuss the responsibilities a trustee bears, what to consider when selecting a trustee who will best exercise those responsibilities, and some additional options that may add flexibility to the decision. The individuals you name to assist with your estate plan should understand that they will be acting in a fiduciary capacity. Fiduciaries are guided by two key principles — loyalty and prudence — and are charged with always working in your best interest. A trustee is responsible for protecting and managing assets for the benefit of the beneficiaries. This complex role may change over time depending on the terms of the estate plan and the circumstances of the grantor. Many trustees also serve in the role of executor. Due to the importance of a trustee role, many plans name contingent trustees to ensure a plan is executed even if there are unforeseen events. An investment manager consults with you to develop a diversified investment plan to include both your financial and nonfinancial assets. The plan includes appropriate asset types and classes and takes into account things that will impact the plan over time — returns, cash flow, time horizon, and tax efficiency. 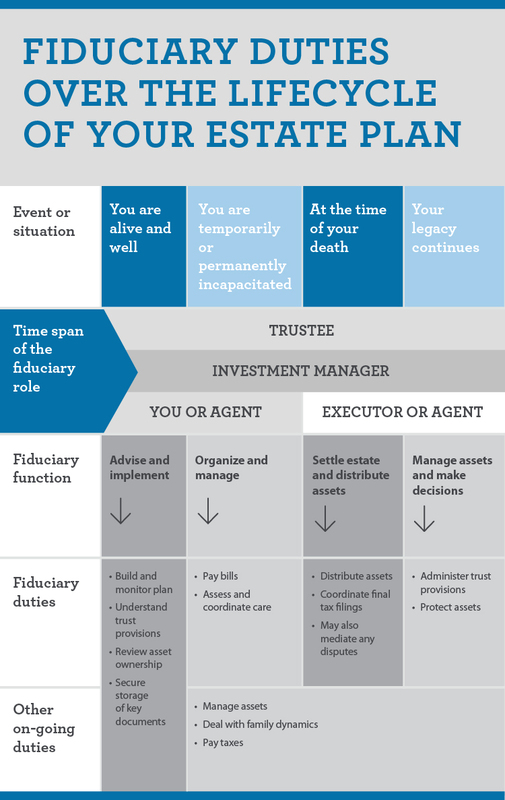 An executor is tasked with settling an estate within the guidelines of a plan. This includes disbursing assets, selling property, paying bills, and filing and paying taxes. An agent works at the direction of an executor in settling an estate. An agent is frequently engaged due to the emotional and financial complexity of executing an estate plan. Agents can serve as a neutral party and help meet the fiduciary requirements of the plan. Given the standard of care to which a trustee is held, and the sometimes difficult decisions a trustee must make, choosing the right trustee is critical to your estate plan’s success. Decide what kind of distribution provisions will be in the trust. Will they be fairly objective or more subjective, requiring greater discretion on the part of the trustee? For example, a trust might allow for a beneficiary’s “support.” Does this support encompass buying the beneficiary a house or merely paying the rent? 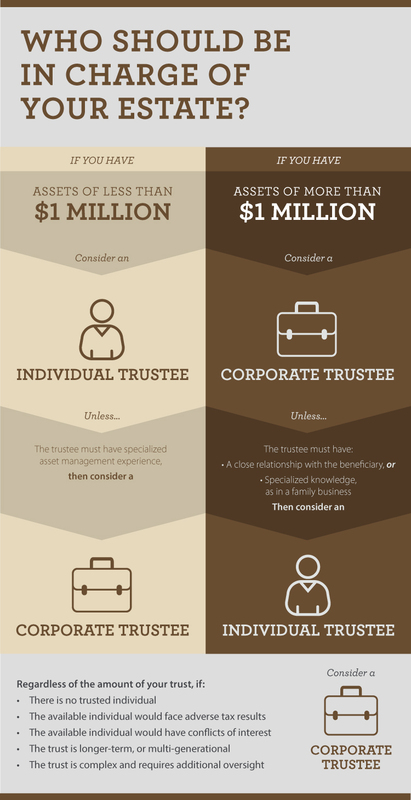 Decide what kind of assets the trustee will be administering. Managing a portfolio of marketable securities requires a very different skill set from that needed to manage a controlling interest in a closely held business. Some practitioners warn that restricting access to trust funds based on beneficiary behavior or success in leading a meaningful life can be counterproductive if it’s not accompanied by significant communication and education. 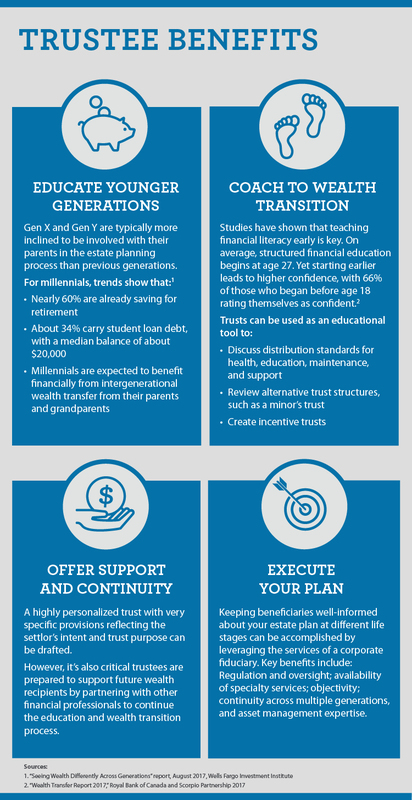 Professional trustees can serve the following functions to help descendants on their journey to financial well-being and transmit those values to the next generation. The decision to appoint an individual or a corporate trustee and to choose the specific trustee requires thoughtful analysis. 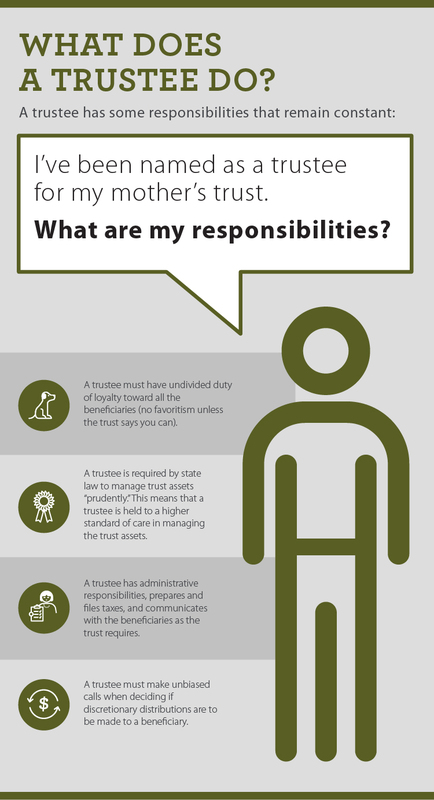 Individual trustees may be the better choice if a particularly close relationship with the beneficiary is needed (when caring for a parent, for example) or if the trust asset requires specialized knowledge (like managing a family business). However, a trustee’s close relationship with a beneficiary can backfire: For example, it’s not always a good idea to name one sibling as the trustee for another sibling because complex emotional ties can get in the way of objective management decisions. Individuals also might be the better choice if the trusts are of smaller value or shorter duration. Corporate trustees often are the better choice when there isn’t a trusted individual available who can both manage trust assets effectively and make the hard decisions about when (and when not) to make distributions. Corporate trustees also are good choices when choosing an individual would lead to adverse income, gift, or estate tax results. A corporate trustee’s actions are reviewed both internally by its own compliance group, and by state and federal banking regulators. Further, most courts hold corporate trustees to higher standards than individuals because they are considered professionals. A corporate trustee has fiduciary and investment specialists on staff as well as advisors that deal with nonfinancial assets. These professionals bring experience, which helps them identify opportunities to improve trust functions, like making certain tax elections or petitioning the court for instructions when needed. Corporate trustees can be used to make unpopular decisions that individuals might have a harder time with, like telling a beneficiary “no” to a distribution request. Trusts are often long-term, multigenerational structures. A corporate trustee provides continuity of trust administration, unaffected by incapacity or death. Trustee investments are governed by state statute and almost always require a “modern portfolio theory” (or “total return”) approach. Corporate trustees use this approach in a disciplined manner. Trustee selection is a critically important — sometimes the most important — part of the estate planning process. A common question is whether a corporate trustee and an individual can serve together as co-trustees. When it works well, this can be an excellent solution, combining the insight of a family member with the administrative experience and asset management expertise of a corporate trustee. To be effective, however, the co-trustee structure must be carefully considered and drafted. For instance, what happens if the co-trustees do not agree? Should there be two or three co-trustees? Should one trustee hold the deciding vote over distributions, investments, or sale of the family business? To alleviate family discord, a corporate trustee could hold the deciding vote over distributions. Still another possibility is to name a corporate trustee as successor, in the event that an individual trustee is unwilling or unable to serve. Chapter Six: When and Why Do I Need to Revisit My Estate Plan?